Kraftwerk are to perform their acclaimed studio albums in full with a series of shows at London's Tate Modern next year. The German electronic music pioneers will be performing their first London shows since 2004 when they play the eight shows in February. Fittingly, the group, whose name translates as "power station", will be performing in the gallery's Turbine Hall, which once housed huge electric generators. Kraftwerk were at the forefront of synthesiser pop and had a huge influence on dance music in the late 1970s and early 1980s, as well as scoring chart hits with tracks such as Autobahn and UK number one single The Model. Coldplay later took the main riff from their 1981 track Computer Love for their single Talk. The group, who at one stage toyed with the idea of sending robots on tour, last played a rare UK gig in 2009 when the cycling-obsessed band members performed at the Velodrome in Manchester. 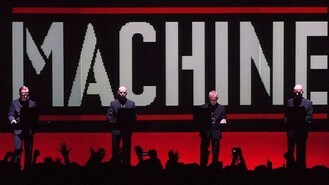 Their new shows - which go under the name Kraftwerk The Catalogue 12345678 Live - will also include high-tech 3D visuals. They will perform their albums in chronological order from Autobahn onwards through releases such as Trans Europe Express, The Man Machine and finishing with most recent collection Tour De France Soundtracks. Tate Modern director Chris Dercon said: "As a former power station, Tate Modern's Turbine Hall is an ideal venue for Kraftwerk's explorations of technology, energy and rhythm. "Bringing together music, video and performance, these events will be true gesamtkunstwerk - a total work of art." Earlier this year, Kraftwerk played a retrospective at the Museum of Modern Art in New York. The Tate shows take place from February 6 to 14 with tickets on sale from Wednesday. Three new acts have been tipped to follow in the footsteps of Adele and Jessie J after being shortlisted for a prestigious award. Jazz composer and pianist Dave Brubeck has died at the age of 91. Noel Gallagher has asked long-time Blur rivals Damon Albarn and Graham Coxon to perform at a charity gig to raise money for the Teenage Cancer Trust. Girls Aloud get all emotional in the video for their new ballad Beautiful Cause You Love Me. Bruno Mars has revealed that Halle Berry is the inspiration behind his raunchy song lyrics. Johnny Depp has joined Aerosmith on stage at a show in LA - just days after rocking out with Alice Cooper. Tulisa Contostavlos may struggle to make the top 20 with her debut album, despite her high profile role on The X Factor, and performing to millions of viewers at the weekend. Fleetwood Mac are back on the road with two new songs - but Stevie Nicks isn't sure if they will make another album.